Please welcome the world's most innovative boot: the Mercurial 360. The first Nike product to feature Flyknit around the entire foot, eliminating the need for a traditional soleplate. The new Superfly VI and Vapor XII, ladies and gents. Enjoy! For 20 years, Nike has designed Mercurial boots for the fastest players in the game, featuring experimental and game-changing innovations. Mercurial 360 builds on that proud tradition with a 360 construction that will soon appear in Nike footwear across other sports. But first, this technology will provide Nike superstars like Cristiano Ronaldo, Kylian Mbappé and Neymar Jr. with the fastest looking boot ever. 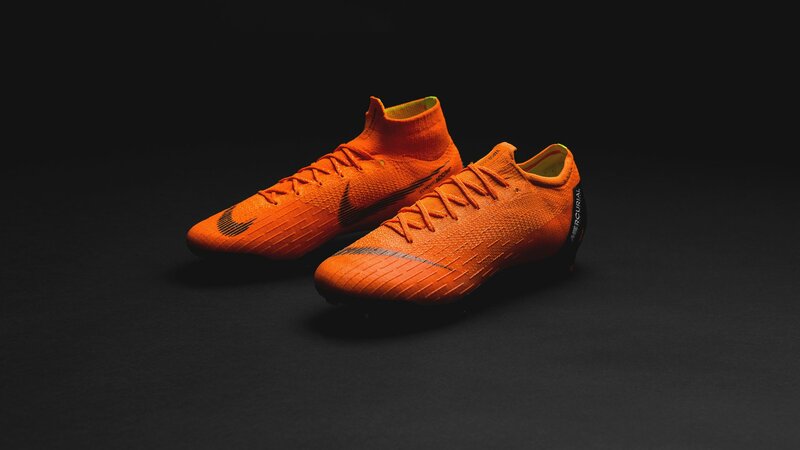 For its 20th anniversary, the Mercurial 360 adopts a clean design with a small forefoot Swoosh featuring an orange debut colourway. And as Mercurial players tend to be some of the fastest players alive, Nike has added a “M” on the heel, which will be the last thing defenders will see when a Mercurial player blows by them. Though the defenders might be scared, we simply can't wait to see the Mercurials on pitch! But hold on, and let's dig in to the techs behind these beauties. Like on many other Nike boots, the Nike Mercurial Superfly and Vapor 360 are all about fit, touch and traction. However, this time the Swoosh has made some major innovative changes to what may already look like the boot of 2018. On the Mercurial Superfly 360, the Dynamic Fit Collar (which is the difference between the two boots) takes on a lower cuff, similar to the modified version Ronaldo has preferred in recent seasons. Both the Superfly and Vapor versions of Mercurial 360 feature a soft, one-piece internal lining, making them both minimal and streamlined. Fit is the foundation of fast. No matter how innovative a pair of football boots may be, if the fit isn’t right, if the foot slides even 1mm inside the boot, speed can be compromised. This is no problem in the new Mercurial because of its game-changing 360 construction made possible through a new advancement in Nike Flyknit technology. This new innovation simply hugs the foot and eliminates the gaps between the foot and the soleplate. Traction is provided by precisely placed studs in the forefoot and heel. Less like a hoof, more like a claw, Nike's inspiration comes from agile cheetahs and focuses on traction at speed. And the reimagined underfoot of the boot is more than just visually stunning. Are you also crazy about the new Nike Mercurial 360? Sign up for the Superfly and the Vapor right here.